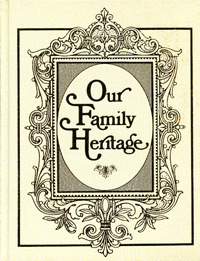 A great gift or keepsake album to record the genealogy and family history. This work contains some 140 pages, illustrated in color, pertaining to virtually every relationship, object, and activity of family life. Each page is dedicated to a separate topic, such as The Family of My Father or Special Memories and leaves ample space thereunder for entering names, birthplaces, ages, and other appropriate information.